Henric looked at Helstof, who held up five fingers. With her hands, Helstof pantomimed stretching. Henric beamed with pride. Helstof rolled her eyes. Henric’s baby horse was a borzoi dog that weighed 140 pounds, and was dumb as an ox. It was only ten months old, and not fully grown. The huge dog was lucky its master was wealthy and owned a 10,000 square foot house for it to run around in. It would follow Henric around all day, from the garage on the ground floor to the bedrooms on the fourth floor. This blockheaded but sweet-natured dog would run up the stairs and down the stairs; around the garage and around the wine cellar; around the kitchen and around the sunrooms. It loved Henric, and Henric loved it. But god, was it dumb. The door to the kitchen opened, and in came Peter, Pater, Selgey, and Bart….the four ballet geeks. Now there was a lot more European kissing, because Peter and Pater were Russian, and even though Selgey was American and Bart was English, they had lived in Europe for a while, and liked that gesture. So between the eight people, there was like, forty-four kisses dished out. If the dog had been in the room, rather than running around loose on the beach, breaking the law, there would have been lots more. Henric pointed to a desk across the living room, which was eighty feet away. The Gromstov’s have a really big living room. The group walked over and stood looking at a large hole in the side. Helstof said, “That’s not the surprise, though that caused the surprise.” She looked at Henric, who nodded. She pointed at the hole, said, “Secret compartment. Had stuff in it. 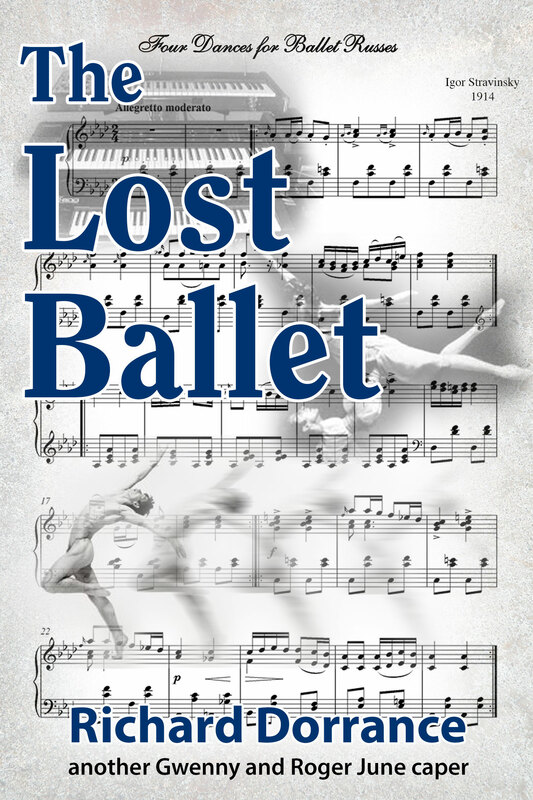 Stuff about ballet.” It was one of several hundred small objects the Gromstovs, the Junes, and the Ps (Peter and Pater) had stolen from warehouses of the Hermitage Museum, in Saint Petersburg, Russia, about a year earlier. All the items had been smuggled back to Charleston in huge shipping containers, and some of them now were in the Gromstov’s house on Kiawah Island. The Junes had masterminded the Hermitage heist. They are real Charlestonians, meaning both their families had lived there since before the Civil War. If your family came to town after the Civil War, say 1870 or so, you are not a real Charlestonian. Peter and Pater, the Ps, no last name, had been security guards at the Hermitage compound, and had been bribed to let the heist team slip out of the museum compound in the dead of night. The bribe had consisted of an offer they couldn’t refuse. After the heist, their employment status at the Hermitage changed from “satisfactory” to “hunt them down like the rats they are, and exterminate them.” So they had vacated the premises along with the stolen goods, and been transported to Charleston on the container ship, in one of the containers. Before becoming trusted members of the Hermitage security force, both of them had been dancers in the Mariinsky ballet corps. When Peter tore the anterior cruciate ligament in his right knee, Pater also ended his career. Partners, for better or for worse. Selgey and Bart, also dancers, had fallen in love during a performance of Swan Lake. According to Selgey, it happened just after Bart threw her upwards toward the ceiling of the Royal Opera House in London’s Covent Garden, and just before he caught her. She said she had been thrown around a lot of stages by a lot of guys during her illustrious career as principle dancer with the American Ballet Theater, but no one other than Bart had thrown her upwards with just one arm, and then caught her with just the one other arm. No one. During that weightless interlude, similar to what astronauts in outer space experience, between the throw and the catch, that was when she decided she was in love with Bart. Bart, on the other hand, said he fell in love with Selgey when, accidentally, he saw her standing naked in front of the mirror in her dressing room. Selgey was the romantic of the two; Bart the pragmatist. They decided to leave the life of world class ballet performance at the same time, get married, and retire out of the limelight to the quaint cultural charms of Charleston. The four dancers, and Henric, were toying with the idea of starting a ballet academy, and had rented a rehearsal space in an old theater on John St., traditionally called The Hall. Now the four Russians, three Americans, and the one Englishman stood together in the really big living room, looking at the busted antique desk, waiting for Helstof to tell them about the surprise. Henric sat on the floor in front of the center of the desk and demonstrated how the secret compartment worked. He stuck his head into the space where a person’s legs were when they sat at the desk. The desk was small, but beautifully crafted, with ornate detailing and finishes, and had one drawer on each side. Henric looked carefully at the inner wall of the side, and at the top, just under the bottom of the drawer, was a small wooden latch, made from the same wood as the side, and very unobtrusive. He turned the latch, and the entire inner wall panel popped away from the outer side, towards him. This panel was connected to the desk by a hinge at the bottom, completely invisible unless the desk was laid on its back or top, which hardly was thinkable, given the quality and beauty of the desk. The days are warmer here in Petersburg than when I left Switzerland two months ago. It is pleasant, but I don’t fancy spending another winter here…..ever. I long to get back to Lausanne to see the little boy and the baby. I spend my days here in the main city library, and at the Hermitage. I have found some interesting material that will help me with Les Noces, but I think I will have to make up much of that story as I go along. I am used to doing that after the last six months, working on the ballet. I could not warm myself to the story you proposed for the ballet, as I am sick of thinking about old Russian gods running around the forests, making life miserable for everyone. So I wrote the score based on some paintings I saw recently in Lausanne by some Frenchmen. They are wild, and that matches my mood over the last six months. When I am bored reading in the libraries, I take out the ballet score and sing it in my head. I am not sure the music is any good, but that may be because I don’t understand the paintings. But they consume me. I must get back to Lausanne soon. Katerina is poorly. She set the articles on the table and translated the second letter. In another post I have sent two more reviews of Rite. The one man is a fool, who wouldn’t know great music if God himself stuck a celestial trumpet in the man’s ear and blew a choir written by angels. The other man also is a fool for praising Bakst for the movements. When it comes time to do Les Noces, I will get someone else who understands the direction you are heading in your musical phantasies, and will not choreograph so as to make all the dancers seem to be in straightjackets and from the lunatic asylum. I have paid off almost all the debts from the Rite production, and soon shall send you funds. We did well on this, and will do better on the next. If you cannot come to Paris to discuss the next dance, I will come to Lausanne. We must speak. We must continue this work. No one can write dance songs the way you will, and I have people who will give us the money to make the productions. You will have as great and large of an orchestra as you want and need. I promise you this, my great friend, and any dancer you want. They all want to fly to your music. Do you still mean to go back to Petersburg? Are things there not very unsettled, dangerous even? The damned Bolsheviks are trouble-makers, and they are serious. Can you not come to Paris and do the research? Please write to me soon and tell me about the new music. It will be wonderful. I await your next work.